After my recent 'success' going around the Yading outer kora in seven days, I am itching for a new challenge. I was thinking that I had done it all when it comes to treks around mountains ranges such as Kawakarpo and Gongga Shan. But I was wrong. There is one unvisited area that has attracted me ever since I saw it on Google Earth - the western glaciers of Kawakarpo. As you may know, the eastern Minyong glacier of Kawakarpo (Meili Xueshan) is now a tourist trap, visited by hundreds of trippers by bus and a short walk every day from Feilai Si. The three western glaciers, however are totally inaccessible by road. The only way to get to them is by taking a long detour from the already remote Kawakarpo kora circuit up untravelled valleys. Since the outer kora already takes at least 10 days, this would make a minimum of two weeks - possibly more, if you did it as an add-on to the whole kora. 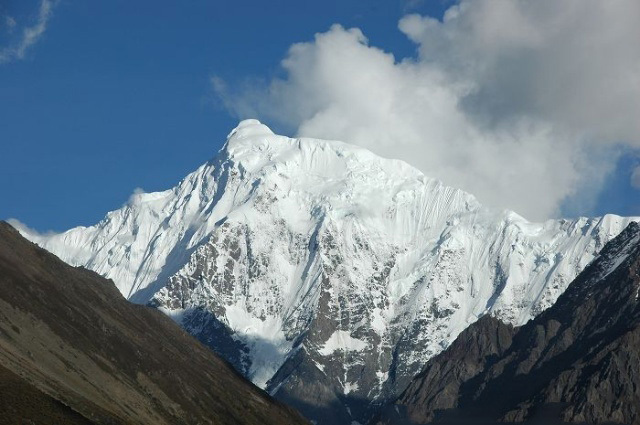 Add to this the fact that the west side of the mountain is in out-of-bounds Tibet means that few - if any - westerners have ever visited or the main western glacier of Kawakarpo. So that's my next challenge, and I'm looking for trekking partners to join me on this exploratory trip. 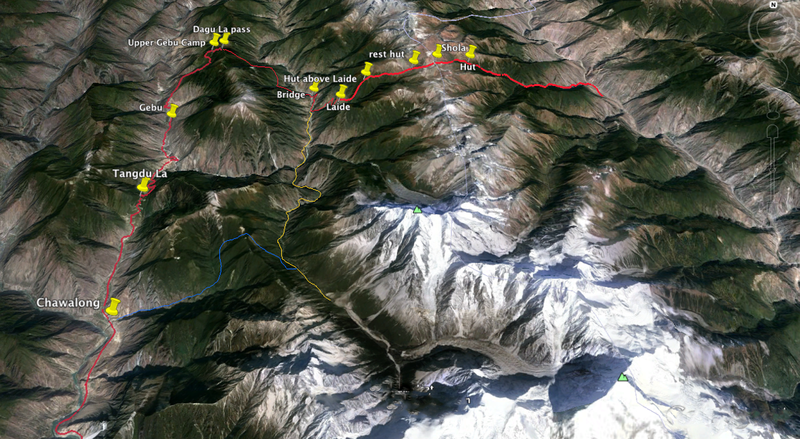 On Google Earth it appears that the only way to get to the biggest and most impressive north west glacier of Kawakarpo is via a long detour to the south, up a steep, narrow trackless valley, starting from the Wi Chu (Oui Qu) river near Laide (see the yellow trail, above). Laide is a waypoint on about Day 8 of the usual kora). The side trip to the glacier looks like a minimum of a four day round trip from Laide. A bit of searching on the Chinese language trekking blogs shows that a few intrepid hikers have made their way over the mule tracks from Chawalong - and they are calling it the Bogong Mountain Pass (伯贡山垭口) to Jiaxing (甲辛) village. It sounds like a bit of a rough trek - but is do-able. I'm now reading up on the journey - with a view to doing this in October. If you are interested, contact me via beijingweek -AT-gmail.com. It will require at least 8 days from Deqin, and I'm planning to set off in early October. The trek will be pretty strenuous and you will have to be experienced & equipped/capable to survive camping/lodging in very basic Tibetan farms for a week. After researching a few Chinese hiking forums and blog posts it seems that Jiaying (the glacier settlement of four houses) is being regularly visited by a few intrepid groups of Chinese visitors to Chawalong. There seems to be a couple of routes - a direct path over the ridge that takes about 8 hours - and an indirect route that uses a newly-created road on the ridge above the village of Longpu. This is part of a new road that the Chawalong authorities are creating to Jiaying - their hope is to turn it into a lucrative tourist destination to rival Minyong glacier on the eastern side of the mountain. 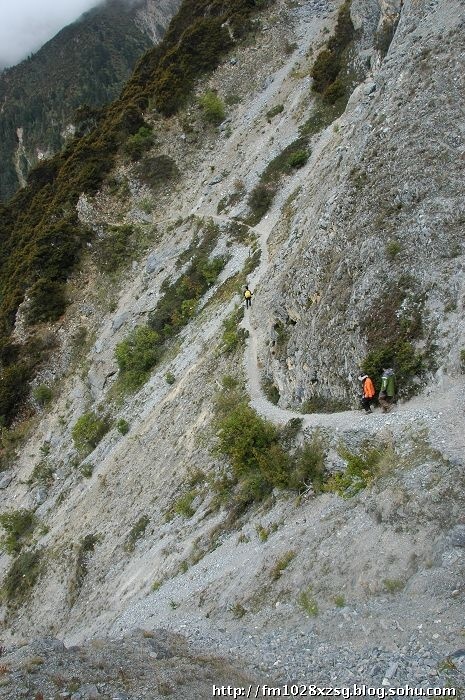 The road is a branch from the Kawa Karpo kora route at the Tangdu La pass. 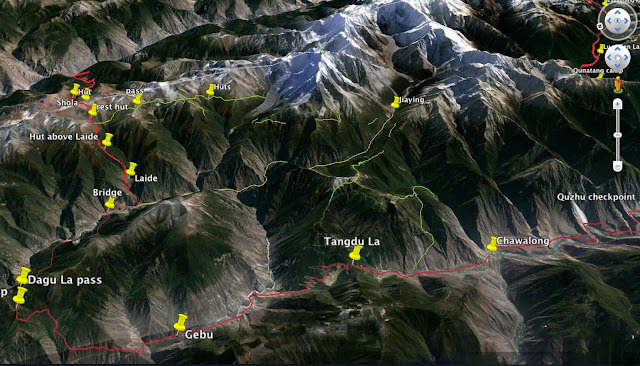 For me these routes pose the obvious problem that they are within Tibet, and this requires an impossible-to-achieve Tibet entry permit to get past the checkpoint south of Chawalong. (I got around this in 2014 by sneaking through the border checkpoint on the back of a motorbike at night, but it seems the checkpoints are now open 24/7 and the border guards - bianfang - becoming more vigilant for foreigners). My Plan B is therefore to try hike in from the Yunnan side. This involves doing the last section of the kora in reverse - up to the Shola Pass. I'm familiar with this route, and it should pose no difficulties unless any pilgrims take offence at someone doing the kora the wrong way round. But I'm not doing the kora - from the Shola there is a clearly visible track that skirts all the way below the ridge to the two glacier sites. Most of it can be seen quite clearly on Google Earth (see below, marked in green). There also appear to be some huts along this route. My plan is therefore to take this route to Jiaying. Once there I have the option of trying to sneak out through Chawalong - or simply returning by the same route. There is also a longer, less steep track that goes back and joins up with the kora route (marked in yellow). If I do get past Chawalong down the Nujiang to Yunnan I plan to re-walk the Dimaluo-Cizhong hike via the She La pass and spend a little longer in the marvellous Sewalong valley. My hiking dates are around early-mid October, departing Deqin. View from the north west: the well-trodden Kawakarpo Kora is marked in red. The tracks to access the western glaciers are marked in green. The longer alternative route is yellow. yes i am interested, but i will have a problem with time, as i should be back in shangrila latest oct 14th ( beside some other problems like finding a babysitter...). can we contact by mail? Thanks Peter, Look forward to reading about your Yading trek. i am a French national living in Shanghai. Roughly from Deqin 10 October, how long do you imagine your trek will last? I wish the timing was a bit earlier in September, as I have two weeks free then. I'm based in Hangzhou, and would be keen to join you on future walks. I've worked with Tomatsu Nakamura on a few mapping projects, most recently an NGM Myanmar climbing article. So was grateful for your posting about his new book. Would be interested in hearing your suggestion for a walk that would take us away from any crowds the first week of October during the holiday out of Lijiang or Kunming. We are considering heading to Yu Beng but now worried it might be a bit crowded due to the Chinese Holiday. Not sure where would be quiet around Golden Week but you could try the She-La pass from Cizhong to Dimaluo (or vice versa) I don't think many people do that route. You could get there via Diqin or up the Mekong from Lijiang via Weixi. See the trek notes on my blog. There's probably a road from Cizhong over to Dimaluo now but it doesn't go on the trek route. Let me first tell you that I have tremendously enjoyed reading josephrock.net in its entirety. Very informative and entertaining to read about your adventures in China.